Reflux in Babies is painful and may be one of the causes of the condition we call colic. So if your baby cries a lot, read on to find out if it might be due to reflux and what you can do to help. We’ve probably all experienced heartburn – a burning, painful sensation in the chest caused by reflux, which is stomach acid washing up into the esophagus. Reflux in Babies occurs as well. But unlike adults, babies can’t tell us what the trouble is and simply popping antacid tablets isn’t an option. 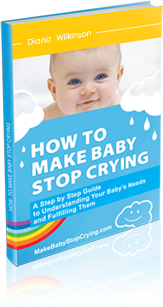 A baby communicates this in the only way possible: a baby cries. Crying is one symptom of reflux. Others include regurgitating milk or formula, or even vomiting. If your baby spits up often, sometimes cries after feedings, but seems happy and healthy and is gaining weight well, then he or she may have mild reflux and there is probably no cause for serious concern. Reflux in Babies is very common, and it usually takes care of itself by the time the baby is around a year old. help. Holding your baby upright, rather than lying him or her down, after feedings will also help the milk or formula and stomach acid to stay down where they belong. If your baby has been showing symptoms of colic – excessive, regular crying, especially after meals – try doing these things to see whether your baby’s colic symptoms are due to reflux. your baby or other approaches to treating his or her more severe reflux.